The Results Are In! America’s Favorite Baskin-Robbins Inspired Iced Coffee Flavors Are…. Last week, we asked our guests which Baskin-Robbins inspired iced coffee flavor was their favorite: Butter Pecan, Pistachio, Cookie Dough, Rocky Road or Jamoca® Almond Fudge. The results are in, and three flavors rose to the top! Our fans casted their vote for their favorite Dunkin’ Donuts iced coffee flavors by commenting on our posts across social media and using one of our five special in-store Snapchat geofilters. 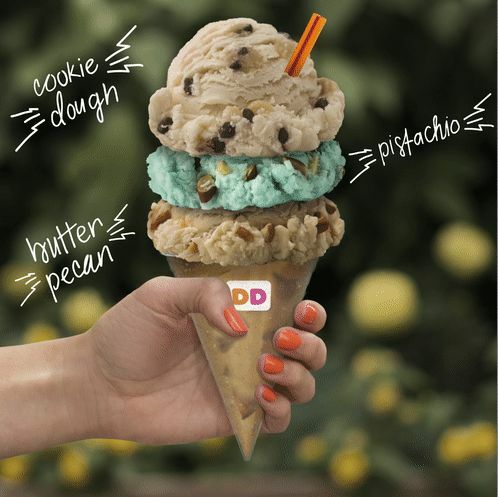 Our fans have spoken, and America’s favorite ice cream inspired coffee flavors are…Cookie Dough, Pistachio and Butter Pecan! Butter Pecan is a fan-favorite we’ve brought back for several years, bringing together indulgent butter roasted pecan and sweet cream flavors. Cookie Dough and Pistachio were also among our guests’ favorite flavors, both inspired by the classic Baskin-Robbins ice cream flavors. Your favorite iced coffee flavors could land back on our menu in summer 2018. Stay tuned to find out!